he term “herniated disc” is used interchangeably with “slipped disc”. In both cases, the soft inside of the disc, known as the nucleus pulposus, “slips” or “herniates” through the tough rind that encases it, known as the annulus fibrosis. 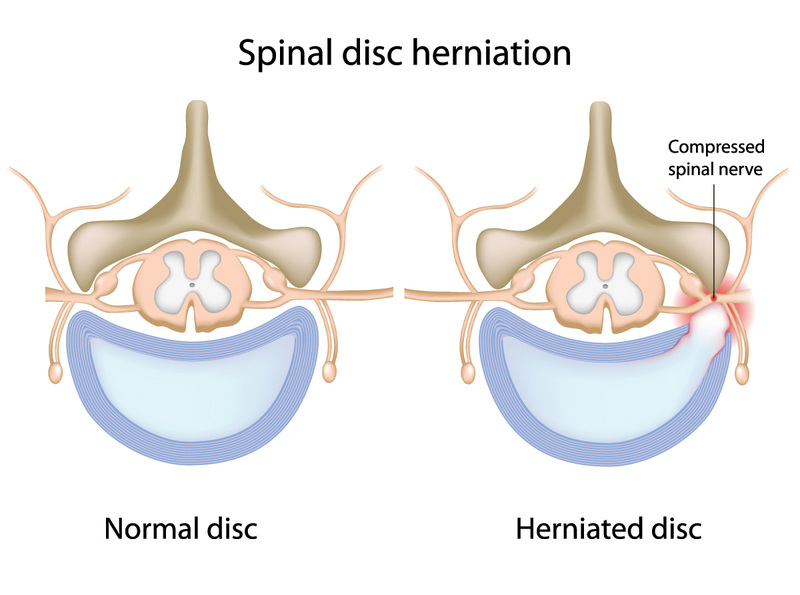 Causes of a herniated disc, like other disc disorders, include the natural aging process, a sudden trauma, repetitive motions, and poor posture, all of which cause discs to break down. Individuals may experience symptoms such as back pain, tingling, or numbness from a herniated disc, are not limited to the area of damage. Rather, if the herniated disc pinches a nerve, then pain can radiate wherever that nerve travels. This is known as radiculopathy, which can cause sciatica. A herniated disc is capable of resolving without surgery. Only 10% of patients with this condition require surgery. To ensure that symptoms quickly decrease, a herniated disc can be managed with activity restriction, physical therapy, and pain medication. For more serious herniations, epidural steroid injections may help. Surgery is reserved only for cases that do not get better or there is nerve damage causing weakness. 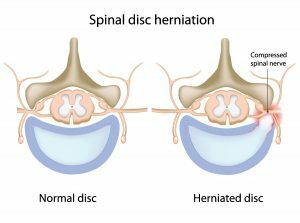 When using a conservative approach to treating a herniated disc, symptoms should resolve within three to six weeks. The expert team at North Jersey Spine Group (NJSG) provides individualized attention from an award-winning spine team of board-certified neurosurgeons who are also spine surgeons, physiatrists, pain management physicians, and physical therapists who collaboratively treat each patient uniquely. With multiple office locations spanning across Northern NJ, patients from Essex County to Sussex County including towns of Glen Ridge, Garfield, and Sparta, NJ are encouraged to contact North Jersey Spine Group today. A herniated disc is capable of resolving without surgery. Only 10% of patients with this condition require surgery.